At New Day Arborist & Tree Service we are asked a lot of the same questions over and over again. 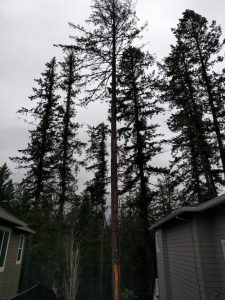 Many times these questions can be summed up with, “should I worry about this tree?” You will be relieved to know that often, there is nothing to worry about. Sometimes, though, there is something that you should worry about. For that reason we provide tree risk assessment and hazard tree removal. 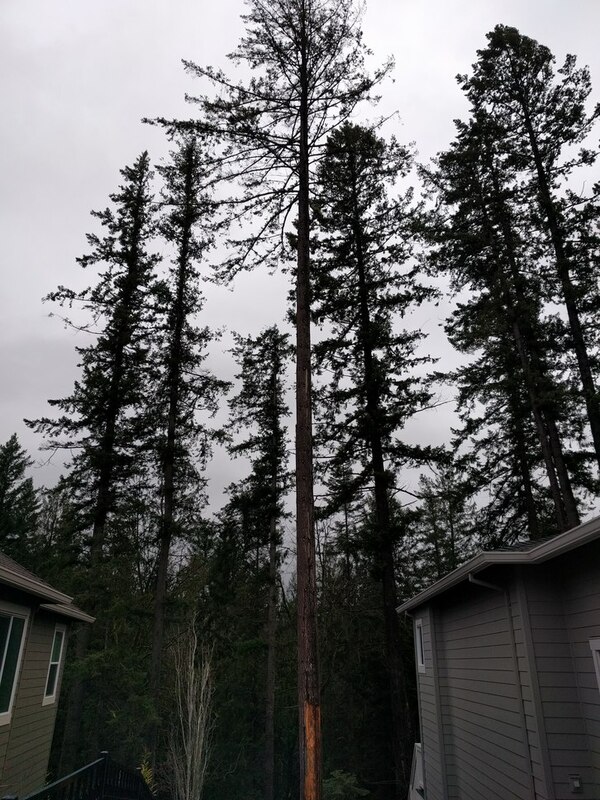 Most of the time when we find something troubling about a tree we can mitigate the risk with tree pruning and other maintenance methods and tree services. Sometimes, however, we recommend removing the tree entirely, which is why we offer hazard tree removal. A physically traumatic event is one where physical stress is applied directly to the tree. Things like ice and snow, wind, lightning, a car crashing into the trunk, neighboring trees losing limbs that fall on the limbs of the tree in question – all these can make a tree something you need to worry about. Less obvious physical trauma to tree includes damage to the root structure of the trees. When a tree loses a portion of its root structure, it can be severely compromised. Some trees have very shallow roots that can be significantly damaged when a sprinkler system is put into the yard. Bugs like the bronze birch borer can even tunnel into your trees and cause them to fail from intense damage below the bark. Systemic infection of trees poses a less obvious risk. Trees can get sick and be compromised by illness just like any other living organism. It takes an experienced arborist to recognize and treat a tree that has become ill due to infection. Environmental hardship is the last big issue that can cause a tree to be stressed enough to fail. Severe drought or overly wet surroundings can cause a tree to die fairly quickly. Being surrounded by neighboring trees that out-compete the tree in question may mean that it doesn’t flourish and becomes a hazard. Being on a hill and having a great view can be pretty sweet, but it comes with some downsides in the form of potential lightning strikes to trees. Many people mistakenly believe that lighting will always leave an obvious mark on a tree, if not destroy it whenever it strikes. This isn’t true. Lightning can strike a tree an leave relatively no trace of a strike. Lightning can damage branches, the trunk, and even the roots of a tree, which can cause so much internal and structural damage to the tree that it is only a matter of time before it becomes a hazard to your family and property. To protect your high-risk trees from lightning strikes, our tree service can outfit the tree with a grounding system that protects it from strikes. While these grounding systems usually cost somewhere between $1500 and $2500, they can mean the difference between life and death for your most picturesque trees. Anytime you notice anything out of the ordinary around your trees you should take note. If you notice large, loose branches on the ground or in the canopy, try to find out where it was attached and why it might have fallen off. If branches are loose in the canopy of the tree, this is an extreme hazard as even small branches can gain enough momentum to injure or kill a person or pet below. If your tree stops producing leaves or begins producing malformed leaves, this can be a sign of infection. If a tree takes longer to leaf out that it has in previous springs, there is a chance that something has gone wrong. Look for a lean in the trunk where there was none before, and whenever you see a tree that has multiple trunks, that’s a pretty good indicator that it could have an issue. Anytime a major weather event takes place it’s not a bad idea to give your trees a once over visual inspection. If you notice anything out of place call us at (360) 608-8160 or contact us via our website. New Day Arborist & Tree Service are happy to give you the peace of mind that you deserve when it comes to your trees! Hire only certified arborists for your tree care.